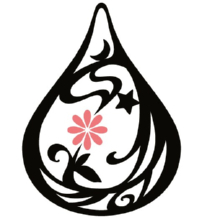 Gantz is a Japanese manga and anime series written and illustrated by Hiroya Oku. 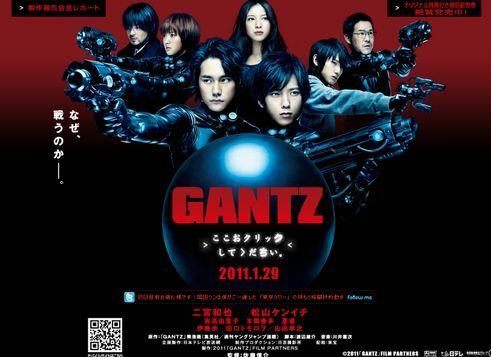 Gantz tells the story of Kei Kurono and his friend Masaru Kato who die in a train accident and become part of a semi-posthumous “game” in which they and several other recently deceased people are forced to hunt down and kill aliens armed with a handful of futuristic items of equipment and weaponry. At a special event for the live-action “GANTZ” movie held on January 10, it was announced that co-stars Kenichi Matsuyama and Kazunari Ninomiya will do stage greetings for the movie in Japan and the United States on the same day, January 20. This will be a first for the industry. On the morning of January 20, they will first attend a stage greeting at a theater in Roppongi. After that, they will take a plane to Los Angeles, where they will attend a stage greeting on the night of January 20 at the famous Grauman’s Chinese Theatre in Hollywood. As previously announced, that event in Hollywood is for the official world premiere of the film, and Matsuyama and Ninomiya’s stage greeting will be relayed live to more than 330 other theaters across the United States that are also screening the movie. 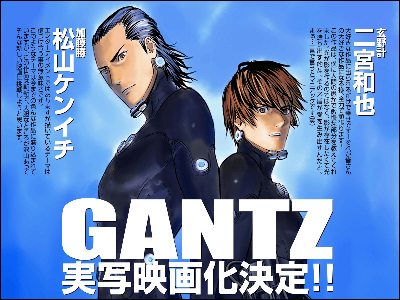 The “GANTZ” movie officially opens in Japan more than a week later on January 29. The sequel is slated to premiere on April 23.